Golfmax Where2Play is constantly being used by golfers making playing decisions. Here are viewing stats that prove it. 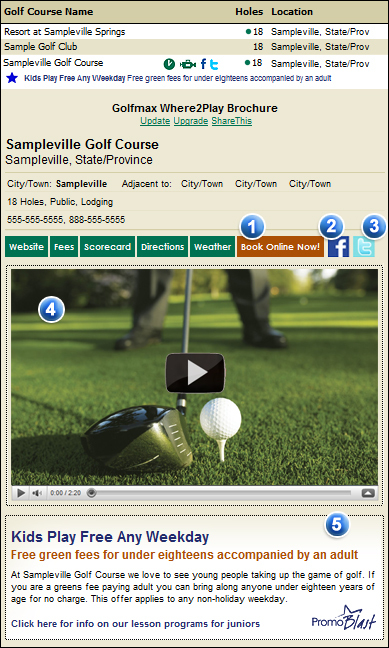 Thousands of golfers golfers access Where2Play everyday from the Golfmax homepage, search engines, social media, and through the American and Canadian golf reports produced by the Weather Network. See our live viewing stats above. Where2Play Interactive allows golf courses to upload their own content and to affordably use Where2Play to generate business. Check out the options below. Your upgrade selections will take effect immediately. Follow the simple three step process below. Your upgrades will take effect within a few minutes of your online payment through Internet Secure. Type the exact address (URL) of the landing page you want to golfers to be presented with when your "Book Online Now" button is clicked. Copy and paste the link from your YouTube video (NOT the embed code). Provide the text label your video will link to. e.g. Kids Play Free Any Weekday, Play and Stay Special, Two for One Coupon, etc. e.g. More Info, View Details, Click Here, etc. 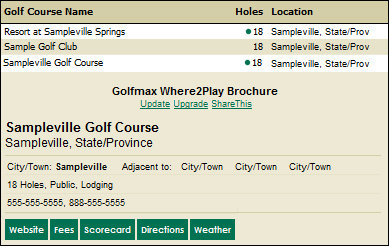 Link Address (URL): Indicate the exact address of the landing page you want to golfers to be presented with when your promotion link is clicked.